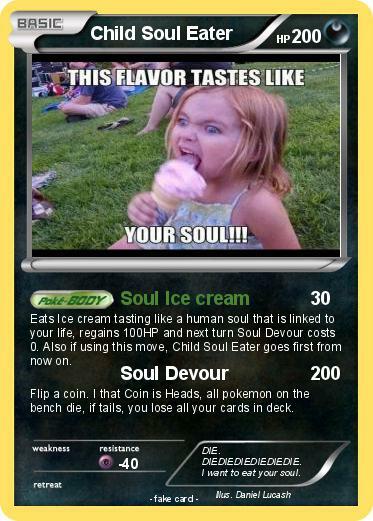 Eats Ice cream tasting like a human soul that is linked to your life, regains 100HP and next turn Soul Devour costs 0. Also if using this move, Child Soul Eater goes first from now on. Flip a coin. I that Coin is Heads, all pokemon on the bench die, if tails, you lose all your cards in deck. Comments : DIE. DIEDIEDIEDIEDIEDIE. I want to eat your soul.